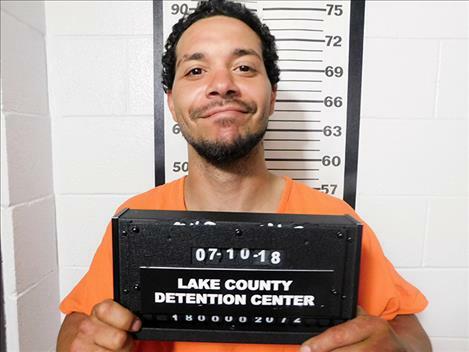 A Ronan man admitted at District Court in Polson on Aug. 8 to breaking into a residence on Haack Road this past December. Bryan Geoffrey Williams, 31, pleaded guilty to felony burglary. According to charging documents, authorities responded to a report of a vehicle in the ditch off the driveway of the late Ed Holland’s residence on Dec. 22, 2017. Deputies with the Lake County Sheriff’s office were familiar with the residence as they had responded to this residence the day before on a coroner call. At the scene deputies located two men and three women. One of the men identified himself as Glenn Reum. The other man, Williams, initially gave a false name before being truthful of his identity. Shoe prints in the snow indicated someone had walked around the residence and possible broke into it. Lake County Deputy Attorney Ben Anciaux said after further investigation Williams would confess to the burglary and took full responsibility for it, clearing Reum and the three women who were with them of any wrong doing. Williams also admitted to a bail jumping charge for missing a court appearance in the burglary case on May 2. Williams’ guilty plea came as part of a plea agreement that will recommend sentencing being deferred for three years on the burglary charge followed by one year deferred on the bail jumping charge plus 30 days jail or until sentencing, whichever is longer. The sentences are to run consecutively to each other. The plea agreement also calls for misdemeanor charges of obstructing justice and criminal mischief being dismissed at sentencing. District Judge James Manley set sentencing for Sept. 12.